The second cycle schools (SHS) super zonals are taking place at various sports centres in the regions of Ghana. Reports from the Ashanti Region says it is very massive as all students want to be part of the action. 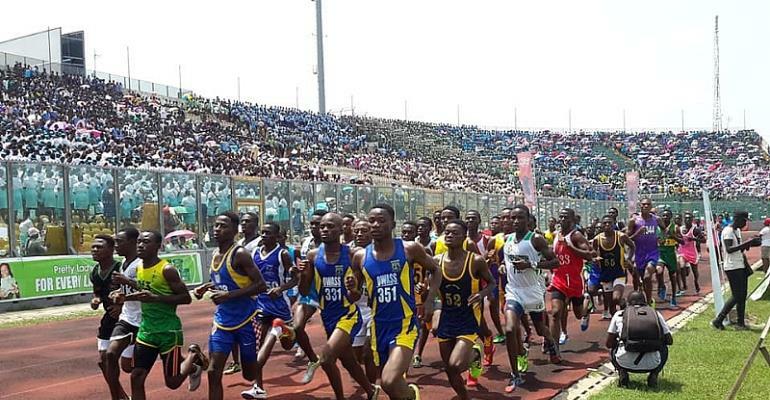 Both sportsmen and women, as well as fans or cheer leaders at the Baba Yara Sports Stadium, want to steal the show. In Sunyani, it was likewise massive and the football final bêtween Sunyani SHS and Bechem SHS had to be rescheduled from Thursday to Friday. Also the Ghana Olympic Committee (GOC) Youth Coordinator, Emmanuel Olla Williams had to intervene to ensure and maintain peace and order for the final match to be played at the Coronation Park. It was interesting to know that the schools had to camp their footballers in hotels to motivate and prepare them for the final match. In Accra at the El Wak Stadium, it was similar and it was refreshing to hear some athletes relishing the ambition of representing Ghana at the Tokyo 2020 Olympic Games. Some of the winners who had high hopes and dreams said they were training for the next Olympic Games and if the Sports Authorities open up for qualification races or meets, they would avail themselves. Others said education is not all about books but their skill and talent can take them to places.